SsangYong has officially unveiled the 2018 Rexton, which will join the Tivoli as part of the South Korean carmaker’s efforts to renew its brand identity. Previously developed under the project name Y400, the car is heavily-influenced by the LIV-2 Concept from last year’s Paris Motor Show, and will be known as the G4 Rexton in its home market. The new car will be the flagship model in SsangYong’s range, positioned above the new Korando and an upcoming seven-seat SUV that was previewed by the XAVL Concept at this year’s Geneva Motor Show. Dimension wise, the Rexton measures 4,850 mm long, 1,920 mm wide, 1,800 mm tall, and has a 2,865 mm wheelbase. SsangYong says the large SUV is constructed according to Quad-Frame body structure using 1.5 Gpa giga-steel – a world first. Additionally, it also features 63% advanced high strength steel (AHSS) to provide improved body strength while keeping the weight low. The SUV’s exterior styling is almost identical to that of the LIV-2 Concept, save for a few minor edits. The hexagonal-shaped front grille gets three horizontal slats as opposed to the mesh setup on the concept, the headlights are more conventional-looking, and the fog lamps have been pushed upwards into the faux side intakes. No shots of the car from other angles were provided but expect the profile and rear to largely mimic that of the Paris concept. 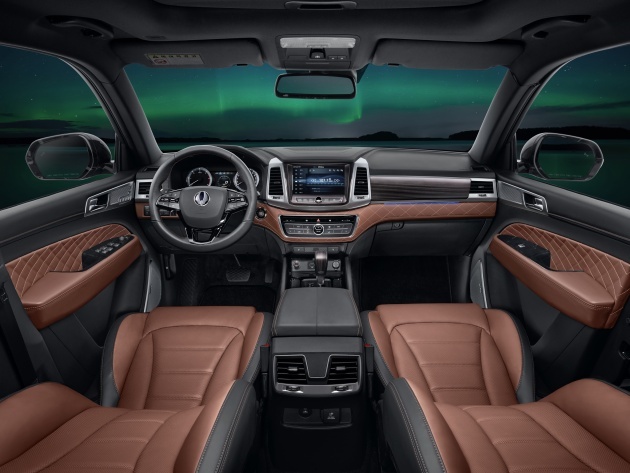 Similarly, the cabin adopts the same layout from the concept, with plenty of quilted leather applied on the lower dash and door cards. Not much in terms of specification details as the Rexton will only be launched later this week, with sales expected to start in Korea during the first half of this year, and internationally before the end of 2017. 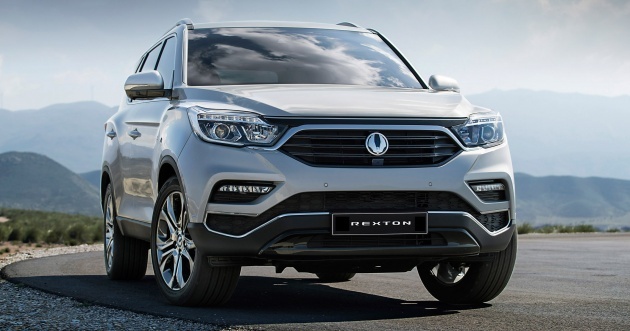 However, we are told the Rexton “will be powered by both petrol and new clean-burning diesel engines.” All-wheel drive is likely a given considering the “company’s reputation as Korea’s oldest vehicle manufacturer and only 4×4 and SUV specialist producer,” as it says in the official press release. Other bits of kit include Apple Carplay and Android Auto with device mirroring for the SUV’s infotainment system, 3D Around View Monitoring (AVM), nine airbags, and a wide 9.2-inch HD touchscreen. Looks like last gen Hilux. Bolih jual ke? will it still be powered by mercedes..? Truth to be told, this ssyang Yong looks quite good actually.maybe because it’s now owned by mahindra.if they could just bolt on a turbocharged engine this would be a serious contender. Otherwise my take is on the Tiguan or Toureg. Quirky styling. But certainly reliable and noteworthy car. Used a Ssangyong Kyron (with Mercedes diesel engine) for 5 years. No major issues only frequent servicing required and replacement of diesel filter due to Euro 2 diesel. But with Euro 5 diesel available currently, worthy to consider if priced right. Nonetheless, the Kyron cost approx RM175k back in the late 90s. Throw away the badge. Park it beside any Japanese/Korean SUV. Chances are it will blend well with the current SUV. The interior looks presentable especially the leather seats is enough to justify it’s comparison. However, when U mention this is a SY, the public will avoid it simply bcos it is not well know for it’s RV & there is not enough SC due to lack of sales. For this alone, SY will have to advertise harder to sell just 100 units. Good luck to U for U need more than luck for selling this Rexton. PS : Your older model that uses the Mercedes engine is a good selling point & its reliable. Good vehicle but unfortunately no more SsangYong dealers in Malaysia. The old Rexton was the de-facto military vehicle. A tough one… now even using 1.5 Gpa giga-steel. Aiyo ini nak ke perang ke? Previous Post: REVIEW: 2017 KTM 1290 Super Duke GT – so, what’s a nice bike like you doing with an engine like this?